I have several friends who live gluten-free lifestyles. A few in interest of reducing carbs and the obvious health benefits and a few who have (or who have children who have) celiac disease. 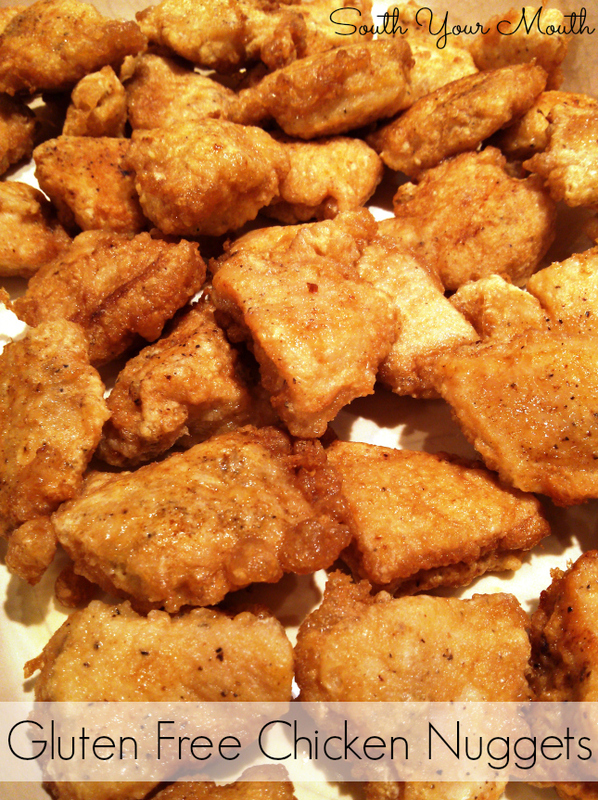 So, when I made the Firecracker Chicken (also GF) the first time, I stopped to take photos of the first step because I had accidentally made gluten-free chicken nuggets and wanted to share them with my friends! You’ll remember how surprised I was at the breading process for the Firecracker Chicken. You first coat the chicken in cornstarch and then dip in egg. These two steps are not uncommon - I’d just never seen a recipe that stopped there. Usually, after dipping in the egg, you then dip in some flour-based mixture before frying. But as the chicken pieces were cooking I was blown away at the beautiful golden brown color. Then I tasted one and couldn't get over how crispy and flavorful it was! I immediately thought of my GF friends and decided to post a recipe for the gluten-free chicken! Heat 1/2 inch of oil in a large skillet over medium-high heat. Cut chicken into 1 1/2 inch pieces then season liberally with salt, pepper and garlic. Coat chicken with cornstarch; set aside. I added my cornstarch to a gallon-sized zip-top bag then added 8-10 pieces of chicken at a time, sealed the bag, shook vigorously and then removed the chicken pieces and it worked like a charm. Beat eggs with 1/2 teaspoon salt then quickly dip cornstarch-coated chicken pieces in egg, shake off excess, then fry in hot oil on both sides until golden brown. Cook in batches to ensure you don’t overcrowd the pan. Serve immediately. I'm a new gf dieter. My question is: what about all the oil its being fried in. And I thought fried foods were not on in the diet. I don't know about the weight loss program, just that these have no gluten in them. Maybe try using coconut oil? this is similar to the chicken nuggets I sometimes make for my sweet & sour chicken. But I marinate them in a small amt. of soy sauce, and no salt & pepper. Tastes great.